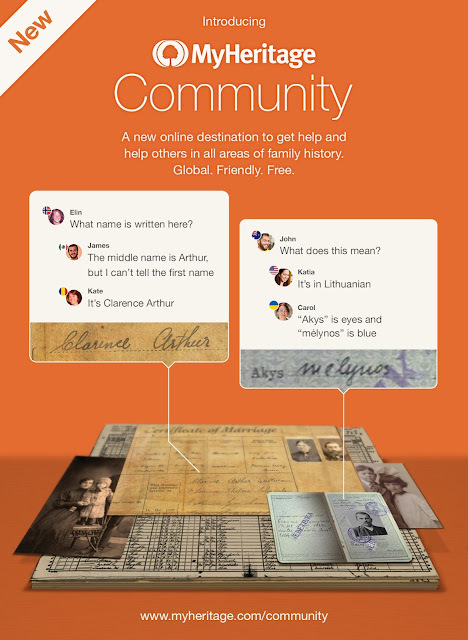 TEL AVIV, Israel & LEHI, Utah, April 19, 2016 — MyHeritage, the fastest-growing destination for discovering, preserving and sharing family history, announced today the launch of MyHeritage Community, a new online Q&A hub that fosters family history research collaboration. MyHeritage Community is built as an image-oriented forum integrated into the website for users to help one another solve genealogical challenges, such as translating documents, deciphering handwritten letters, identifying unknown people in photos and searching for elusive ancestors. With more than 81 million users around the world registered on MyHeritage and 42 languages supported, MyHeritage Community is uniquely positioned to serve as a meeting place for people trying to solve genealogical mysteries, and other people willing to help them. Users looking for assistance can post requests in the MyHeritage Community to get expert genealogy advice or benefit from native language expertise and local geographic familiarity. For example: a user in the United States with roots in Germany can post an image of an ancestor’s handwritten letter written in Kurrent — old German handwriting — and ask for help deciphering it. Another user from Germany can then translate it and add first-hand information on the town from which the letter was posted. Volunteerism is an important value in the world of genealogy. Since the recent release of the MyHeritage Community, inspiring cases of users helping other users continue to surface. Examples include a user who posted a request for information on her relatives from a specific region in Italy and received pinpointed advice down to the address of the relevant office to contact; a user who asked for a translation of a church certificate from Portuguese to English and received a full translation and in-depth explanation of the purpose and origin of the document; plus many more. MyHeritage Community is free, and is accessible at www.myheritage.com/community. The Community Q&A Hub looks slick, but there does not seem to be any rhyme or reason for the postings. If there were categories, I believe the "squares" or "boxes" would make more sense. I hope the organization of it will improve over time so each post is not helter-skelter. The other situation is that to find Community, one has to scroll all the way down to the bottom of a screen or page and look for the word in fairly dimly lighted columns. Some pages in My Heritage get rather long when working on a family tree or merging smart matches, etc. If you live in a mobile home you will have to do things a little different than remodeling a normal home. It is natural that your mobile home won't beckon any pressing need to upgrade, irrespective of its extent.